Indoor cats (cats that are not allowed out side of the home) is rather a contentious point and can spark some heated conversation. Personally I am not a fan of cats being kept inside all the time, but I do understand that in some cases it may be the only option. In cases where cats do have to be kept inside all the time, I do think it is very important for cat owners to understand the needs of their cat and to make sure that the cats home life and inside environment is as suitable and as entertaining as possible. This page also has some broader guidance for all cat owners as to how to make a cats home environment generally more interesting. Can Indoor Cats Get Bored? Cats are naturally inquisitive animals and have senses much more acute than our own. In the wild and for cats who go outside they are able to use these senses as well as satisfying some of their natural instincts as well as using up energy. Cats who stay inside all the time need their home environment to be as stimulating as possible so that they do not become bored or frustrated and in some cases even depressed. 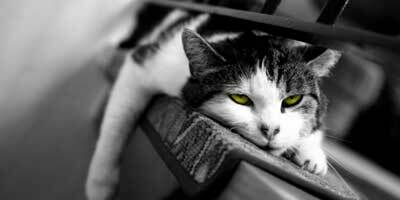 A bored cat, is a stressed cat and a stressed cat, is a cat who's behavior can become destructive or difficult. Scratching furniture, inappropriate urination and excessive meowing can all be signs of a bored or stressed cat. Cats can also become overweight if they do not get the right amount of exercise that they would outside and again bored cats may revert to over eating to fill their time. So by providing activities for your cat during the day that will encourage them to climb and jump will help to keep them alert and happy. Making sure that your cat has everything that it needs during the day while you are out and ensuring that your cat has easy access to both food, water, toys and the litter tray is essential cat care. Water bowls - Leave several water bowls filled with fresh water daily around the house. Little Mo has water bowls upstairs and down and she likes to alternate between the two on a daily basis. Food - Leaving wet food out during the day is not practical or hygienic, as flies will lay their eggs quite quickly onto wet food. Instead leave some dry kibble for your indoor cat to nibble on during the day. Make sure that not too much is left out as this encourages over eating. Litter Tray - Place litter trays in quiet places around the home and never near food bowls. If you have more than one cat then a tray needs to be provided for each cat and again they should not be near to each other. Cats do not like to smell another cat's urine; this is often the cause of cats urinating elsewhere in the home. 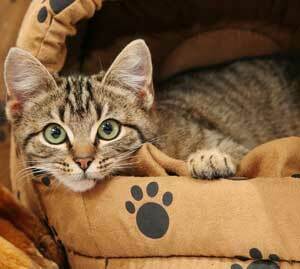 Bedding - Cats love to sleep, a lot, so making sure that they have a warm comfortable place to sleep is important. It may even be a good idea to leave several cat cushions in their favourite spots to prevent them sleeping on beds and making them hairy. Little Mo are you listening? ?Not on the bed please! Closing doors to rooms containing precious breakable items. Tie loose cables together and hide them under furniture. The cat specialists call it environmental enrichment, or "fun things for your kitty to do" to the rest of us. Basically it just means making your cats' environment during the day challenging, active and fun, so that they are not bored and stressed during the day. It doesn't cost a lot to prevent your indoor cat from becoming bored, all you have to do is think like a cat and think, "what things do I like to do?" 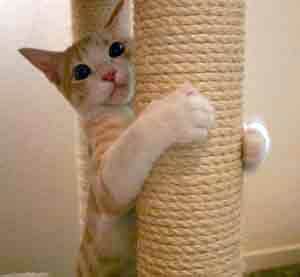 Climbing and jumping - this is great exercise for your cat and it is one of the most natural things they like to do. 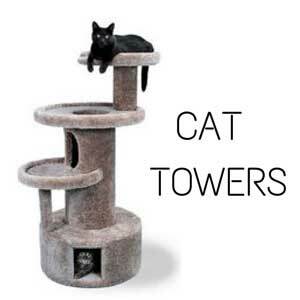 To prevent them using your furniture as their cat gym, get them a cat tree. These come in all shapes and sizes and will help them to sharpen their claws, climb, stretch and perch. Your cat will also love to be up high, Little Mo loves to be at our head height most of the time, I think she loves the eye contact. Playing and Hunting - Leave various types of cat toy around the house during the day. Balls are great for chasing and cloth mice are good for batting and biting. 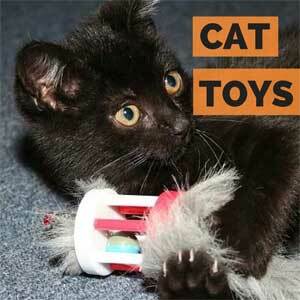 Make sure the toys are safe for cats and no loose parts will come off. It is also important that you spend some time playing with your indoor cat during the evening and interactive toys like cat fishing rods are perfect for an exciting game that both of you will enjoy. It helps your cat feel secure in their environment and around people as they are left alone often during the day. Hiding - Little Mo loves to play hiding games with her self where I think she is imaging that she is hiding from prey or another cat and loves to pounce out of the box at the most unexpected moment. Provide old cardboard boxes around the house with a few toys inside for added fun. Catnip - Many cats love catnip, it relaxes them and they seem to really go crazy for it. Toys can be bought with catnip inside or you could even provide your indoor cat with their own little tray of fresh growing catnip for them to chew on. Cat videos - Many cats like the sound of human voices being around during the day, it may help them to feel secure. You could leave a radio on for them, or for a bit more variety of sounds and visual stimulus, you could buy them specially designed cat videos to leave on during the day. These videos contain pictures of birds and other animals etc to catch the eye and ear of your cat, helping to keep them entertained. Whenever we have to leave Little Mo in on her own for any length of time our house ends up looking like a cats playground, with toys and beds and boxes everywhere. Why, because we learnt the hard way and once left her alone without much to do. When we got home she had very uncharacteristically urinated on our beds, defecated on carpets and had a temper tantrum and pushed items off of high shelves including a box of cornflakes. She must have been very stressed for her to do these things; she has never done them since. So be warned, have a bored kitty at your peril. These pages will help you to find things which will help to keep your inside cat happy and occupied throughout the day.